Marijuana, a derivative of the plant Cannabis sativa, has been used for recreational and therapeutic purposes for a thousands of years. However, how marijuana modifies variety of brain functions was a long-standing mystery. In 1964, Δ9-tetrahydrocannabinol (Δ9-THC) was identified as the main psychoactive component of marijuana. The receptor for Δ9-THC was reported in 1990, and was termed cannabinoid CB1 receptor. The second cannabinoid receptor, CB2, was reported in 1993. Meanwhile, the endogenous ligands for CB1 and CB2 receptors (endocannabinoids) were sought and two lipid compounds, anandamide and 2-arachidonoylglycerol (2-AG), were identified in 1992 and 1995, respectively. 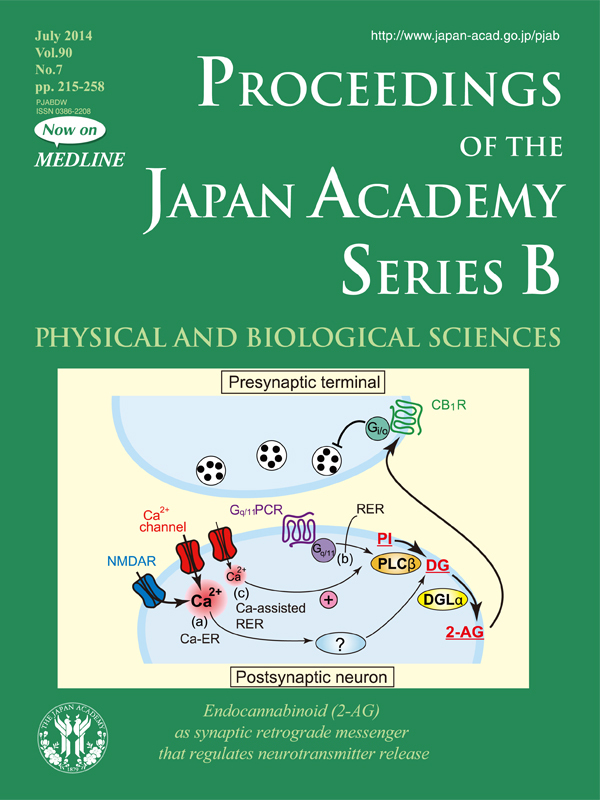 However, physiological roles of the endocannabinoid system remained unclear until 2001 when Prof. Masanobu Kano’s group and two other laboratories discovered that endocannabinoids function as “retrograde messenger” at synapses. His group demonstrated that depolarization of postsynaptic neurons releases endocannabinoid that retrogradely acts on presynaptic CB1 receptor and suppresses neurotransmitter release. His group also found that activation of Gq/11-coupled receptors in postsynaptic neurons causes endocannabinoid-mediated retrograde suppression of neurotransmitter release. By 2010, Prof. Kano and colleagues identified key molecules that involved in these phenomena and elucidated their basic mechanisms (see the cover figure and pp. 235-250 in his review). 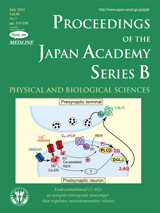 His group demonstrated that the endocannabinoid 2-AG is released from postsynaptic neurons following a large Ca2+ elevation caused by activation of voltage-gated Ca2+ channels or NMDARs, strong activation of Gq/11-coupled receptors, or combined subthreshold Ca2+ elevation and weak Gq/11-coupled receptor activation. Since CB1 receptor is widely expressed in presynaptic terminals throughout the brain, Prof. Kano proposes that 2-AG-mediated retrograde suppression is a fundamental and ubiquitous mechanism for the regulation of neurotransmitter release, and that this form of synaptic modulation therefore influences variety of brain functions. *The figure was modified from Fig. 2 in Ohno-Shosaku, T., Tanimura, A., Hashimotodani, Y. and Kano, M. (2012) The Neuroscientist 18, 119-132.